What a wonderful Turkey Cake...perfect for any Thanksgiving Celebration! It's almost too pretty to eat. Add a few festive decorations and it makes a perfect centerpiece. A round ball cake pan was used for the body. The body and the green base below the turkey is made of white cake. The feathers and the wints are made out candy melts on skewers. The head is shaped fondant on a skewer. 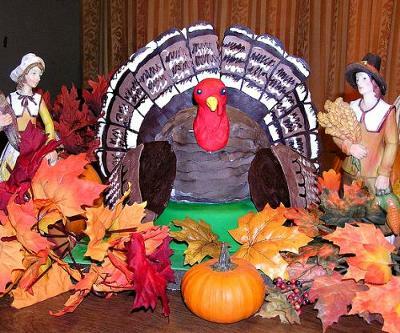 Special thanks to Stephanie for allowing us the use of her creative Thanksgiving cake idea! 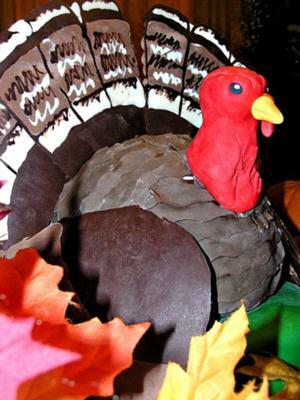 This Turkey cake is so realistic that it's hard to believe it's a cake!! 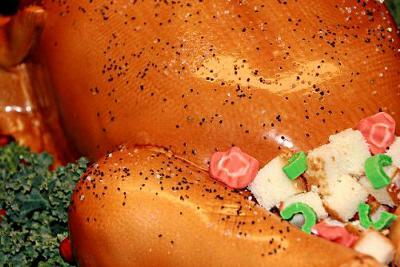 The attention to detail down to the sprinkled pepper and texture on the "skin of the turkey" is wonderful. I love the stuffing, celery and crinkle cut carrots. This cake is a made from a vanilla cake with chocolate buttercream, fondant, RKT for drumsticks. The stuffing is made out of small square pieces of cut cake. Fondant is used to make the celery and carrots. Real Kale, oranges and cranberries surround the turkey giving it added realism. Sugar sprinkles are used for the pepper seasoning. Special thanks to Mark for allowing us the use of his pictures!! This would be a perfect centerpiece for Thanksgiving. 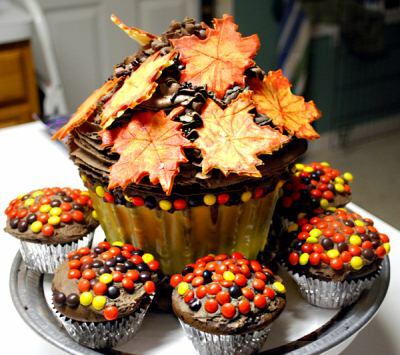 Cute Fall or Thanksgiving Giant Cupcake with beautiful Maple leaves. Perfect for any party or in this case Bridget's husband's potluck! The Wilton Giant Cupcake pan was used to make the cake, fondant was used to form the base, chocolate buttercream icing for the top. Hand made painted gum paste was used to sculpt the fabulous maple leaves. The cupcakes were decorated with mini reeses pieces complementing the big cupcake perfectly. 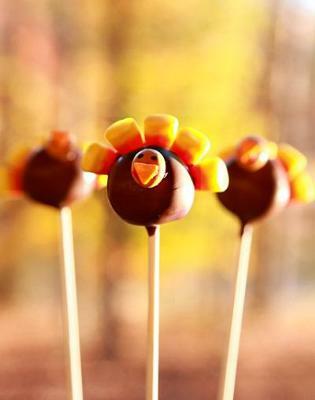 Turkey Cake Pops are perfect for little ones. These cute little turkeys will put a smile on every young child. Double chocolate espresso cake pops covered with dark chocolate candy coating, candy corn for the tails and decorated like Thanksgiving turkeys. Thank you April for allowing us the use of your photo!! It's such a cute idea for a Thanksgiving party.